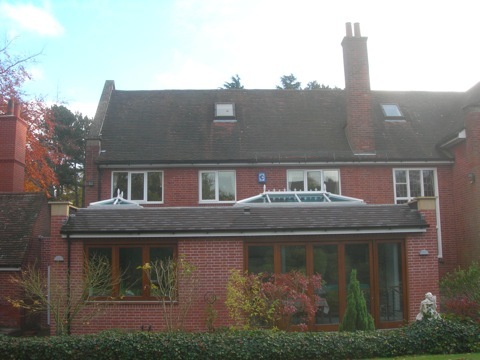 John Woodcock provided us with design and project management services for a major home improvement project. 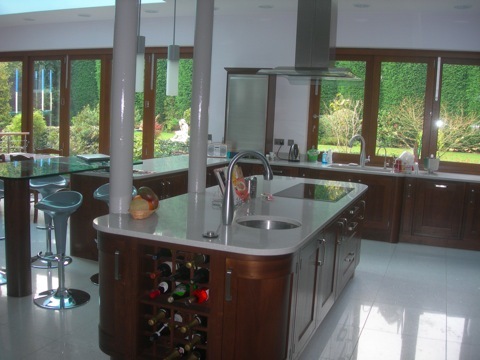 The project involved extending our kitchen, lounge and master bedroom. Aswell as extending the building, the project also included removing some existing internal walls in the kitchen, to further increase the space available and re-siting the ensuite in the master bedroom. John was tremendously helpful from the begining. Using his experience in design and building regulations he was able to provide excellent advice on what it would be possible to achieve during the project and provided us with a good insight as to how the completed building work would look. My wife & I both work full time and John’s project management services to us were invaluable. He was frequently on-site to check on progress and ensure that the project was progressing smoothly. When issues arose John clearly explained these to us and set out the alternatives that were available. John arranged regular evening meetings for us, himself and the main contractor so we were fully informed of progress at all times. The fact that John had undertaken the design work meant that as a project manager he was also able to offer us continuity. He understood what we were trying to achieve from the project and was able to provide guidance to all the contractors accordingly. John is both professional and approachable and I would have no hesitation in recommending him to undertake design and project management services. We have no hesitation in recommending John Woodcock. Our house extension seems to be part of the original house, which demonstrates Mr Woodcock’s skill. We have finished with more house for our money than if we had moved, and saved about £30,000 in the process. We were most impressed with the way in which he approached the entire job from start to finish. His clever planning and design were matched by the way in which he diplomatically dealt with any problem. Disruption was contained to the minimum. The work was always on target and the contractors most trustworthy - it was a relief to be able to leave the house and know that everything would be alright. Mr Woodcock’s shrewd commissioning of the builders more than paid for his own services and he walked through the minefield for us, taking all the worry off our shoulders. 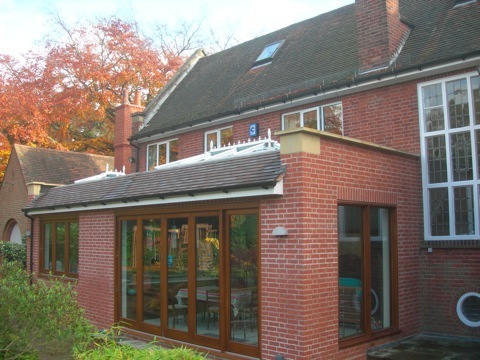 We are delighted with the in-depth service provided by John Woodcock who we employed to deal with a kitchen extension and the adaptation of existing accommodation. I found John pleasant and straight forward to deal with and a man of great integrity. His word was his bond. He clearly has experience of the solutions required for a job and of suppliers. 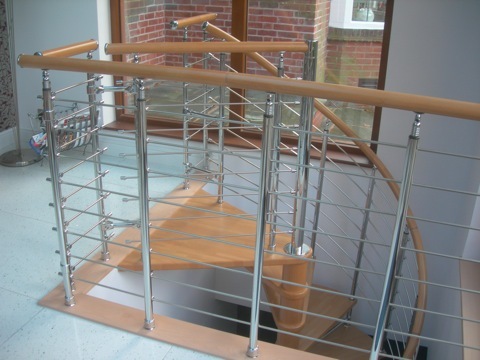 His contacts in the building trade enabled him to provide a very cost effective package. Mr P. Thompson, Wylde Green. I could not have been more delighted with the extension designed and supervised by John Woodcock. From the outset I specified that the extension must look like part of the original house and not something that has been added on. John has achieved this superbly and we are very pleased at how he used the space. We also retained him to supervise the appointment of a builder and his advice in this respect and throughout the project proved invaluable, as the work was carried out to a high standard at a very competitive price. Mr Woodcock was engaged by the council and prepared the design and plans for a single storey house extension to suit the needs of my family. My daughter has cerebral palsy and is multi-handicapped. It was good to have someone of Mr Woodcocks experience to take all the worry off our shoulders, particularly in terms of understanding and complying with the legislation involved. When we purchased our home in Moor Hall Drive we required a number of alterations but since we are both in busy jobs and travelling extensively we felt that we needed a professional managing agent to oversee the necessary work. John Woodcock was recommended to us by a colleague and it is one of the best decisions we made to engage John in the management of the project. The work involved everything from structural analysis of an existing roof to the fitting of bedroom furniture. John provided a no fuss professional service, ensuring that only reputable tradesmen were employed and that all prices negotiated were fair and strictly adhered to. During the project we were away from home frequently but felt comfortable in the knowledge that John was controlling the access. We found him to be a totally trustworthy and professional. We are absolutely delighted with the final result and have no hesitation in recommending John to any client who would wish a no stress, no hassle experience. I am delighted with the result of your efforts and would have no hesitation in recommending you to my friends who are in the market for any form of house extension or construction. Once again thank you for a first class job completed on time. John Woodcock is a dedicated, enthusiastic professional and is one of the most reliable people I have EVER worked with. Vast experience in housing rehabilitation, area improvement and management, his negotiating skills made him a valued member of my past teams. His personal charm and friendliness together with his business like, efficient and thorough approach to problems has brought him success in many appointments and projects. I can heartily recommend him to his clients. Former Departmental Head and Chief Executive of Inst. Environmental Health Officers. “Since I spoke to the leader of the council, I took care to ensure that anybody I passed on went to Mr John Woodcock, a person of integrity and competence, who would deal properly with applications and would not rip people off. I took the trouble to interview him, not on my own but with another Birmingham Member, to ascertain that he was a person of integrity and competence. Everybody I have referred to him has spoken highly of the way in which he dealt with these matters”. I am writing to thank you for the work you did on behalf of my constituent at Moat Lane with regard to her application for Urban Renewal Grant. It has made a real difference. We are delighted to recommend Mr John Woodcock. From our initial ideas, he quickly produced outstanding plans for our house extension that has since been built. Throughout the planning stages we had no delays and we can vouch for his thoroughness, enthusiasm and professionalism. I employed Mr Woodcock as a result of a personal recommendation. After a site visit and discussion he came back to me with a set of drawings and proposals that were completely acceptable. His drawings were neat and accurate, his attention to detail was excellent and he was successful in resolving very complex planning issues. I would recommend his services to anyone and will hopefully be employing him again in the future. I am pleased to recommend the services of John Woodcock. He assisted me when my property was damaged by a burst water main. His expertise in dealing with the water authority, the insurance companies and the contractors who did the remedial works proved to be invaluable. All the works were completed at no expense to myself. We would like to thank you & the builders selected by you for the excellent building work carried out on your behalf. Friends & neighbours say, “What new porch?”, it is so good is appears to be part of the original house, this impresses us a great deal as we so dislike extensions that stand out like a sore thumb. The building team were second to none, absolutely excellent, very pleasant & we had a complete feeling of trust in them, and what a pleasure to see such a pride to detail and with you John overseeing the job any queries were addressed amicably & promptly. We have over the years had many dealings with builders and architects, but none can compare with the team work that transpired from a very well managed project. First rate all round, we would certainly recommend your services to anyone without any doubt or fear. Wishing you all every success for the future. Although our building work was on a relatively small scale, there were nevertheless technical problems to overcome, and your independent advice and frequent supervision ensured that the work was done properly. We had heard that there could be problems when having replacement windows installed, particularly with reference to quality & obtaining a fair price. Various companies have differing standards in this respect. If a job goes well, okay, everyone is happy, but if not the client often has no recourse to satisfaction & justice. However, there was one man we knew we could rely on to ensure that we obtained the best possible quality at the right price- John Woodcock - and having been so happy with his previous service we decided to ask him back to mastermind the new work. We were not disappointed because John is so professional and works closely with other professionals in the trade, we had the job carried out promptly, efficiently and at a very competitive price. Needless to say, the new windows were installed to our compete satisfaction. We also asked John to oversee the installation of the new bathroom for the very same reasons. Previously, when having similar work carried out we had experienced delays, but not with John Woodcock looking after our interests. Difficulties were avoided and the whole scheme was completed with utmost efficiency. John’s extensive experience will tell him immediately if a tradesperson is attempting to overcharge &, indeed, John himself obtains competitive quotations. There is always the potential for companies to make large & unfair profits, but they cannot do this with John Woodcock keeping a watching brief, and of course, his ideas & advice on design & layout are invaluable. We found John to be most helpful & efficient at all stages of our extension work & his knowledge of all the necessary planning/ Building Regulations at the outset was of vital importance. I would always use his services again. I must tell you how delighted I am with the extension you fitted to my kitchen. From the first idea of the project to completion, I did not have a single worry. You arranged and oversaw everything, from planning permission to completion by the builders, who incidentally were really first class. I was very impressed with your involvement at every stage to see the work was progressing to your satisfaction. We first became aquainted with John, through his article in the Select magazine. We were looking for some building work and after reading all about his work, he seemed the ideal person to undertake our project. He prepared and designed everything we had asked for with such enthusiasm it was breathtaking. He was there to negotiate on our behalf and over see the whole project from start to finish. We are totally delighted with the result. If we had to do it again John would be at the top of our list, he’s invaluable. Having John to design and oversee the whole project takes all the worry and uncertainty out of your hands. We are delighted to recommend Mr J.Woodcock, who following discussion with us as to our requirements, undertook in its entirety all that was necessary for our extension. His work was methodical and complete, from the initial survey of the existing property to obtaining building and planning permission, drawing up of detailed plans and overseeing the entire building works. His attention to detail both for the complicated planning issues and aesthetic appearance of the completed work were excellent. At all times we were made aware of the progress of the work. His thoughtfulness included accommodating the inconvenience to ourselves and our neighbours. We found his expertise in all aspects of our requirements most beneficial, giving us piece of mind that the work was in capable hands. If, in future we require further work to be undertaken we would have no hesitation in employing John Woodcock. I would like to place on record my thanks and appreciation for the excellent job you did for us on the loft conversion. Your work was carried out with enthusiasm and commitment and your liaison with, and persuasion of, the Birmingham Planning Authorities proved to be more than helpful in the early stages of the project. Both Eileen and myself are delighted with the ‘finished product’ and would have no hesitation in recommending your services to others. Above all we believe that we have received a ‘good value for money’ service. Should you require, and given due notice, we would be more than happy to show any of your prospective loft conversion clients around. 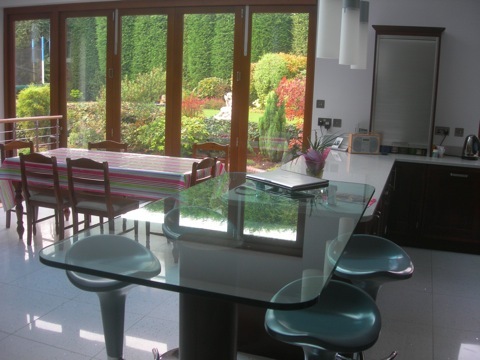 Internal view of breakfast area, Luttrell Road, Sutton Coldfield. We employed John Woodcock after reading his advertisement in Select Magazine. We were contemplating quite a large extension to our house, but unfortunately hadn’t the confidence to start & thus kept putting the idea to one side. We decided to contact John who came along & promised us that he could eliminate all our worries by organising the whole thing from start to finish. This he did with the utmost efficiency. After several consultations with us he drew up plans for Local Authority approval, sought the best value for money quotation from builders, started work on the agreed date, & amazingly finished the project on exactly the agreed date. All this was carried out with cheerfulness & great efficiency with nothing being too much trouble. I would not hesitate to recommend John’s services to anyone. Before we met John, we knew absolutely nothing of building work. We needed someone who could explain everything and take care of all the organisation. John sounded like the ideal man for the job. He came around for a meeting and filled us with many ideas and suggestions, together with plenty of advice on what was feasible. He was very reassuring financially, explaining all of the costs individually and negotiating a very fair price on our behalf. Once the work had started there was minimal disruption. It was a truly professional job, the brick matching was superb, and this year when we decided to have more work done, we had absolutely no hesitation in having John back. He was our first and only choice. John was the only person we would have gone back to. He spends time listening to what we want, and he’s only happy if we are. We chose to have John back for the third time because of the responsibility he took for all of the work being done. Also, he was very trustworthy. We knew what we wanted to achieve but didn’t know what was possible. John advised us on what would work and came up with a very good package. Reading other peoples testimonials and seeing pictures reassured us that John was as reputable and honest as he had appeared to us. Although he took a lot of the pressure off us by doing the organising himself, we still felt very involved. John discussed what was occurring at every stage. I heard of him through a personal recommendation and he definitely lived up to my expectations. John was very easy to talk to, taking into account what we wanted doing and giving us advice on what was and wasn’t possible. He came up with suggestions and alternatives – he really is a specialist in his job. The guide which he left after our first meeting was very reassuring, to know that so many people were so impressed with his work. I would have no hesitation in recommending him to anyone. “It has been a great pleasure to deal with you & I don’t think we could have possibly managed without your help”. We are writing to thank you personally for all your hard work on this venture. Your vast knowledge and experience, professionalism and attention to often minute detail have been invaluable to us from start to finish. Just as importantly however, your approachability and flexibility towards problem solving helped create an environment of collaboration and involvement within the process, allowing us control over decisions without our feeling the burden of responsibility. Genuine concern from you that our wishes were conveyed in both ‘letter & spirit’ is illustration in itself of the integrity of your work John and for this we are truly grateful. We would both also wish to thank the builders for the first class work they produced and the respect that they afforded us all here. They are a credit to their firm and proved time and again that craftsmanship and integrity is worth so much to people like us. Thanking you again for all your help. We would like to thank you for all your help in designing and arranging for the construction of our new porch. We are very pleased with all aspects of the work, both the detail of design and quality of construction. Please convey our thanks to the building company also. Thank you for the assiduous attention you have paid our extension project during its course. We have appreciated the ability to delegate all problems and negotiations with the various suppliers of services to yourself. We are very happy with the result & only wish we had had you on board during our previous project! Thanks for having got the survey done as quickly and as thoroughly as you have. It is exactly what I was looking for. Having recently suffered the loss of my husband and being disabled through a road traffic accident, I knew I wanted to stay in my home, but it needed a complete overhaul but how could I get someone reliable to carry out the extensive work? Then the name of John Woodcock was mentioned to my daughter. A meeting was set up and from that moment on all the work entailed was taken out of our hands, which gave us freedom from stress. John arranged everything from the planning stage right through to the end of the work, which took thirteen weeks. I cannot thank you enough for all your expertise without which both Lesley and I would have been floundering. Obviously we needed help to enable me to stay in the home Lou and I shared for many years. Everyone who has been to see me since I moved back home have been full of praise at all the work that has been carried out. The transformation has been a pleasure to see and I would never hesitate to recommend John to anyone needing work to be carried out on their property. The house is looking wonderful, I was delighted when I first saw it and would like to thank you so much for being understanding about mom’s needs and her desire to get back to the house as soon as possible. Thank you very much for all the work you have put into ensuring our extension project was completed successfully. We both feel that your planning and monitoring of the project was the major factor in everything running smoothly and you took the majority of the stress involved in major work at home, away. Thanks again. When we needed extra space in our bungalow we decided to convert the loft into a master bedroom and bathroom. At the suggestion of a friend we engaged John to design and supervise the project. This was an important decision. He drew up our plans, communicated with local authority planners, supervised the build, liaising constantly with the builders, plumbers and electricians, ensuring that everything ran according to plan with no delays or unexpected hitches. He was always available to deal with any concerns we had and he made the project a lot less stressful. We can happily recommend John to others.